Freezing marinated chicken enables you to prepare tasty meals without a lot of effort. Marinades help to keep chicken tender and moist, while adding flavor, whether you opt for Italian seasonings, honey mustard or Asian flavors. Marinate bone-in chicken, skinless-boneless chicken breasts or even cut up chicken to bake or broil, stir-fry, or add to salads and pasta dishes. Having ready-to-cook chicken in the freezer can speed meal preparation and let you skip the take-out. 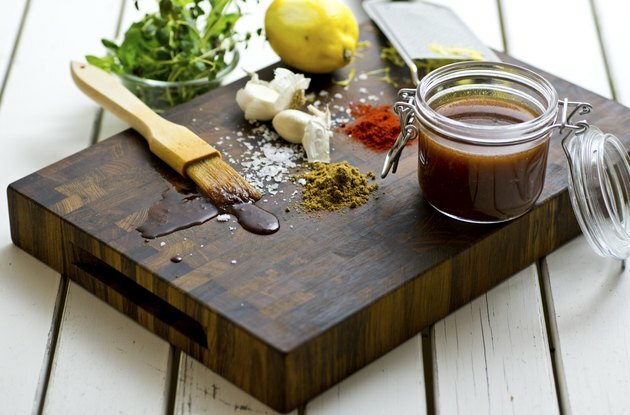 Pour store-bought marinade or the ingredients for your favorite homemade marinade into a 1-qt. to 1-gallon-sized resealable freezer bag. Close the bag and shake it to mix the ingredients as needed. Freeze some marinade separately if you plan to use it as a sauce. Rinse and pat dry the chicken. Slice, chop or cut it up as desired for your final meal. Open the freezer bag and add the chicken. Seal the bag securely, and shake it to coat the chicken. Lay the chicken flat in the freezer for convenient storage. Once the marinade and chicken are frozen, you can store the bag upright. Thaw your frozen, marinated chicken in the refrigerator or microwave, and cook the chicken as desired on the grill, in the oven or on the stove. Cook chicken until it reaches an internal temperature of 165 degrees Fahrenheit and is no longer pink in the center. The juices should run clear. You can use frozen chicken, but thaw it in the refrigerator and refreeze it without allowing it to warm. There may be a slight loss of quality if the chicken is thawed and refrozen, rather than starting with fresh chicken. Package other ingredients for the meal in resealable freezer bags, like vegetables for fajitas, and freeze all items in a neat, labeled stack. Food safety matters, especially when it comes to poultry, so follow the U.S. Department of Agriculture recommendations for freezing, thawing and cooking.